Baseball is a game of numbers, some more accessible than others. Rates, averages, linear weights, aging curves, and WAR are only a few of the myriad statistics influencing decision makers in MLB franchises. An endless amount of data is accessible to the average fan at many sites, most notably the Lahman Baseball Database, which is the most robust catalog of MLB player statistics available to the public. One area of relatively limited accessibility to the average fan is statistics for Minor League players. Though player statistics by position, year, and team are available at many sites, a thorough catalog of MiLB data akin to the Lahman database is unavailable. I wonder who Kris Bryant would be most similar to? What do you mean Baseball Reference doesn't calculate similarity scores for minor league players? Let's make our own damn database! The function below will construct each team's minor league website, for every desired year, and pull out the same table every time. Let's start with the Arizona Diamondbacks batting statistics from 2012-2014. We'll call the data frame we're about to pull the variable "minors_batting_ARI". We're reconstructing the url http://www.baseball-reference.com/minors/affiliate.cgi?id=ARI&year=2014 and instructing the scraper to pull the necessary data table and then repeat the process for next season. We're calling the pulled data table 'df' for simplicity. So far our code will scrape the batting table from the team's minor league page, but we also need to extract each player's Minor League baseball-reference id using it's href. Isn't that right Chris Young? No. Not you, Chris Young. The other, lankier Chris Young. We're good man, no need to get angry. 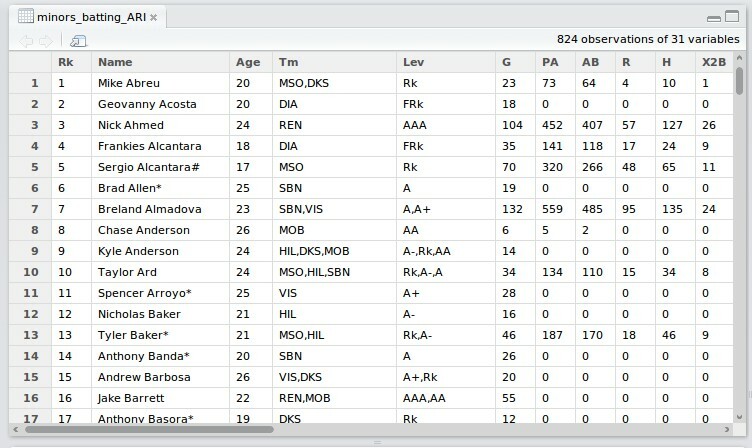 Using R formatting code we delete unnecessary rows and create a column called bref_player_id to assign each player’s unique reference id. We’re trimming out characters from the href attributes we don’t need, leaving only the reference ids. ... let's take a left turn on Grind Parkway and pull in all MiLB batting statistics for 2014. First we'll need a list of baseball-reference's team codes. I'll do the dirty work and include franchise codes for each team since 1969 if you want to play with that data 2. Will pull in minor league batting statistics for Oakland and Tampa Bay for the years 2005-2010. The query takes about a 1:45 for every league-wide season pull. Pro-Tip! Get that query going and have some breakfast/lunch/dinner. Stay tuned to the site for another post about similarity scores and to learn more about Kris Bryant’s best comparisons. Baseball Reference has made slight alterations to their website that has deprecated the code above as originally published. An updated version of the scraper code can be found here.